You know there is a natural way to find the soul of parenting. A pure essence of being between you and your child. Every parent on the planet has experienced this. In your the heart is an organic rhythmic beat that simply tunes into the heartbeat of your child. This is the treasure of parenting. This is the treasure within. This workbook for parents is for you to re-discover the wonder, joy and deep connection to the soul of you as a parent so you can connect to the heart and soul of your child. Perhaps you have become discouraged with the “normal” ways of relating to children (nagging, bribing, controlling, shouting) and know deep down they don’t serve you or your child. Get set to take a wonderful journey to the Treasure Island of Parenting where you can find treasures for yourself and your family. Turn around your own childhood history ? Live without the thought “I’m not good enough as a parent”? Make the changes it takes to bring more fun, connection and peace into your home? Raise your children with more joy, delight and enthusiasm. If you can answer yes to these statements then you are ready to map the territory of your own family and find the treasure of a wonderful connection and great relationship with your children. What I like the most about the workbook is that whenever I grab it and spend some time with it, I then feel happier, more positive, calmer and better equipped to deal with my boys. I know parenting is not peaceful all the time. Or at least I’ve yet to meet a parent who has told me it is (and I’m open to hearing about it!) And, my experience is that there is always a way back to the treasure, the treasure is your peace, joy and flow as a parent. The treasure is a joyful connection to your child. This handbook includes over 60 pages of worksheets and meditations to help you cultivate that loving connection within yourself that then can get mirrored to you through your child. Follow the simple directions, have fun with the exercises, sit in the meditations and gain more awareness. 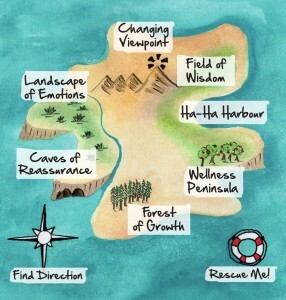 In your own time, work through the treasure map workbook and find your own way to the treasure within yourself which is a joyful, loving connection to your own sweet self and also your child or children. 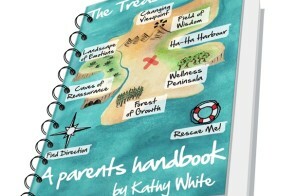 The workbook also incorporates the Treasure Island of parenting, takes you on the journey, mapped out for you, through the landscape of emotions, the forest of growth and much much more. If haven’t already done so , I invite you to sign up to Joyful Parents and Access Your Inner Calm Meditation – which comes from the workbook. It gives you a lovely calming sample of how you can access the treasures within yourself. Get ready to enjoy the discoveries as you write, draw, explore and study The Treasure Within and receive the full benefit of that treasure of a loving connected relationship between for yourself and for your child. I invite you to create more joy in your family now!